How to edit contacts data using the website interface. Note: Contacts data is broken out in three different sheets, Core, Attributes and Tags. Learn more about the different types of data types in the "Different types of data fields" section below. 1.) Select "Contacts" from the left navigation menu. 2.) Click the "Edit" icon to the left of the contact you would like to edit. 3.) Select the "Core" sheet to edit core attributes. 4.) Select the "Attributes" sheet to add/edit Attributes. 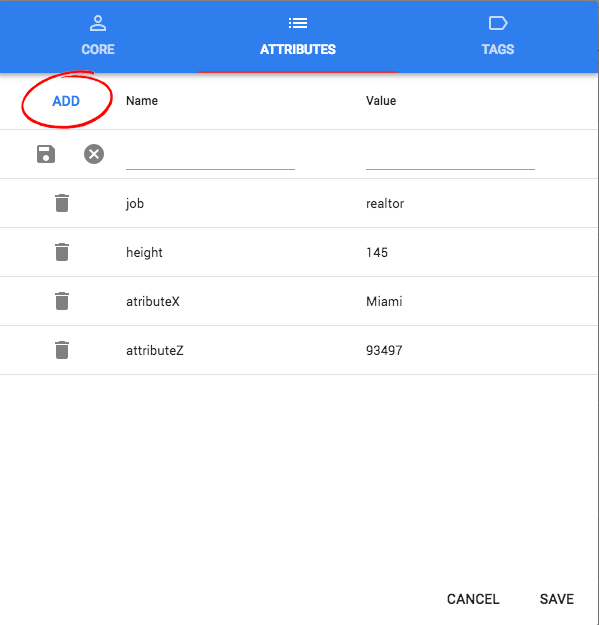 Adding attributes - New attributes can be added by clicking the "ADD" button. Enter your Name/Value data and click the "Save" icon. Deleting attributes - Existing attributes can be deleted by clicking the "Trash" icon. Editing attributes - Editing of an existing attribute is not currently supported. If changes to an existing attribute are required, please delete the existing attribute and add a new attribute. 5.) Select the "Tags" sheet to add/edit Tags. Adding tags - New tags can be added by typing your tag name in the field box to the left of the "+" icon and clicking the "+" icon. Note that tags are case sensitive. Deleting tags - Existing tags can be deleted by clicking the "X" icon to the right of each tag name. Editing tags - Editing of an existing tags is not currently supported. If changes to an existing tag is required, please delete the existing tag and add a new tag. 6.) After you're done with your edits, click the "Save" icon in the bottom right to save your changes. Required Fields - the country code and mobile number are required for every contact. 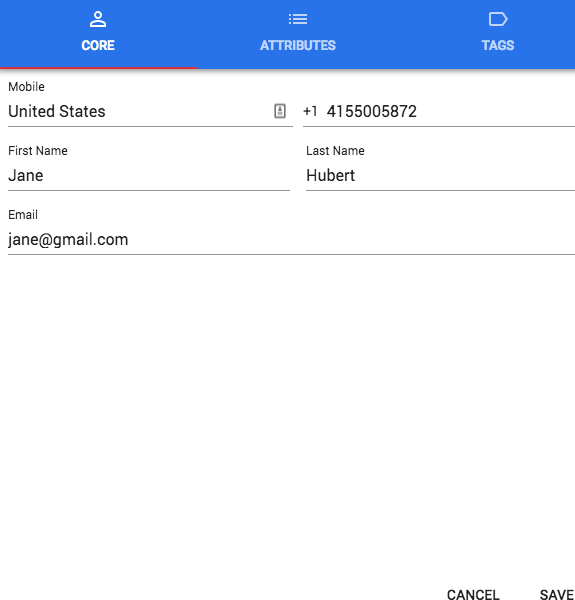 Core Fields [Optional] - First name, last name and email are core fields. These fields are optional, but a placeholder always exists for these values. Core fields can be used in messaging campaigns to filter your results and can be add as wildcard fields in text messages. Attributes [Optional] - Attributes are completely customizable by the user. Each attribute will include a Name/Value pair (e.g. Name = "Job Title", Value = "Mover"). Attributes can be used in messaging campaigns to filter your results and can be add as wildcard fields in text messages. Tags [Optional] - Tags are completely customizable by the user. Each customer can have 0 to N tags. 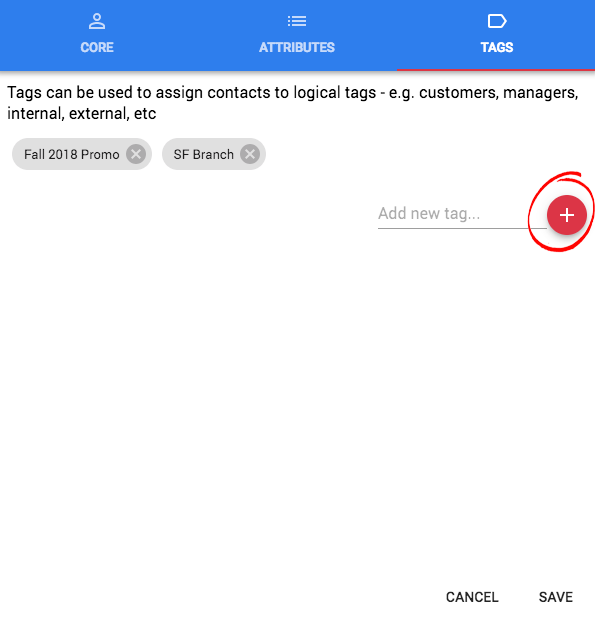 Tags are a quick way to group contacts together (e.g. "San Diego Office" or "Fall 2018 Campaign") and can be used in messaging campaigns to filter your results.